Bodine, 42, of Marion, is a civil engineer. He also owns My Imprint Studios in Marion. “This is my third job,” he joked last week inside his new business at 127 Harding Way East, sandwiched between the Galion Inquirer and the Candi Bar. He opened his business — which caters to those who smoke electronic cigarettes a week ago. But he wants his customers to do more than just buy what he’s selling. He hopes Downtown Vapor Lounge becomes a place that is comfortable and cozy and people will to spend a little time there. He proud of the look he’s created and hopes it encourages foot traffic and regular customers. There is sitting area in the back of the store, which he hopes sees a lot of use. Downtown Vapor Lounge is open 11 a.m. to 7 p.m. Monday through Saturday. His business caters to a younger crowd, which fits well with other things happening in his Galion neighborhood. On Facebook you can learn more about Downtown Vapor Lounge at dvlgalion or call him at 419-462-VAPE (8273). Bodine has smoked e-cigarettes for 18 years. He has for sale 34 flavors, some that he manufactures himself. He is willing to explain and demonstrate to customers how e-cigarettes work. He also likes the tone and the mood of the downtown Galion area, and is looking forward to become a part of a community that seems to welcome newcomers. Bodine said there seems to be good things happening in Galion and he’d like Downtown Vapor Lounge to be a part of that community. Russ Kent | Galion Inquirer Downtown Vapor Lounge owner Mike Bodine at his new business at 127 Harding Way East in Galion. He sells e-juice and the merchandise needed to smoke e-cigarettes. He’s created some of the flavors he sells and the artwork that adorns the walls and counter of his story are produced by another company he owns, My Imprint Studios. in Marion. Galion Vapor Lounge is open 11 a.m. to 7 p.m. Monday through Saturday. 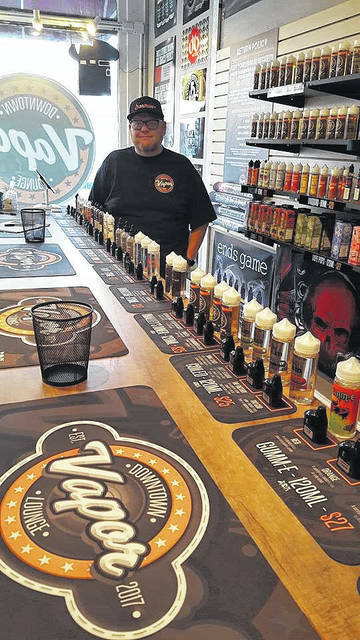 https://www.galioninquirer.com/wp-content/uploads/sites/38/2017/11/web1_Vapor-Lounge.jpgRuss Kent | Galion Inquirer Downtown Vapor Lounge owner Mike Bodine at his new business at 127 Harding Way East in Galion. He sells e-juice and the merchandise needed to smoke e-cigarettes. He’s created some of the flavors he sells and the artwork that adorns the walls and counter of his story are produced by another company he owns, My Imprint Studios. in Marion. Galion Vapor Lounge is open 11 a.m. to 7 p.m. Monday through Saturday. Email Russ Kent at rkent@aimmediamidwest.com.